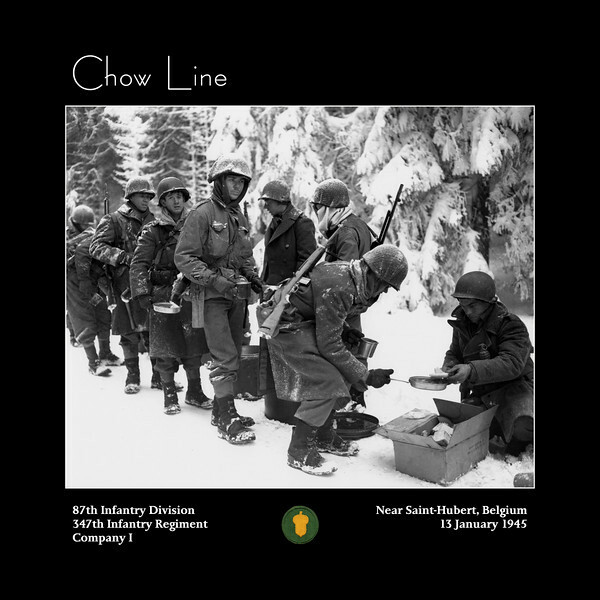 Prints are now available of these special edition images based on U.S. Army Signal Corps photos of the 87th Infantry Division. Just select the photo you're interested in, then click the "Buy" button. After vicious fighting in the sub-zero cold snows of the dense Ardennes Forest, soldiers receive a rare respite from the frontline infantryman's usual foxhole fare of terror and frozen K-rations. The photo presented is U.S. Army Signal Corps photo SC-198849. It has become one of the most widely publicized Battle of the Bulge scenes, and has been featured in many books, magazines, and documentaries. I would like the names of the men in this photo. The Caption on the photo taken by the Army Signal Corps, reads..."On the Road to LaRoche"....However the 347 th and other Regiments did not go there...They entered Le Commune St. Ode...and fought in Moircy, Bonnerue, Pironpre and St. Hubert...La Roche was under the siege of the 84th INF. DIV.